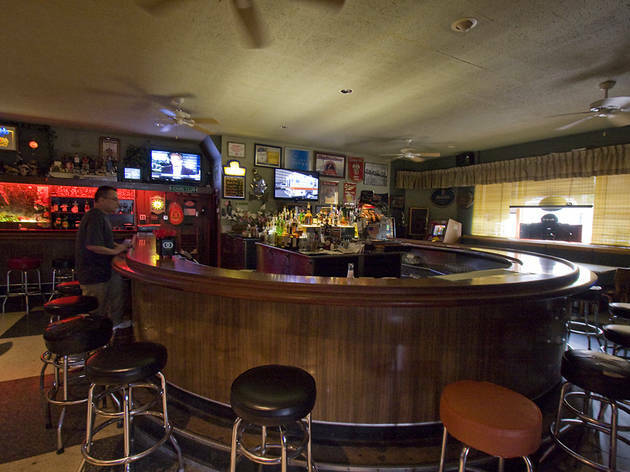 A writer explores a nearby stretch of bars. Perhaps the most pertinent question surrounding Dave Matthews Band’s decision to host its music festival at 83rd Street and the lake: Where, oh where, to pregame? A few girlfriends and I investigate the options near the 93rd Street Metra. 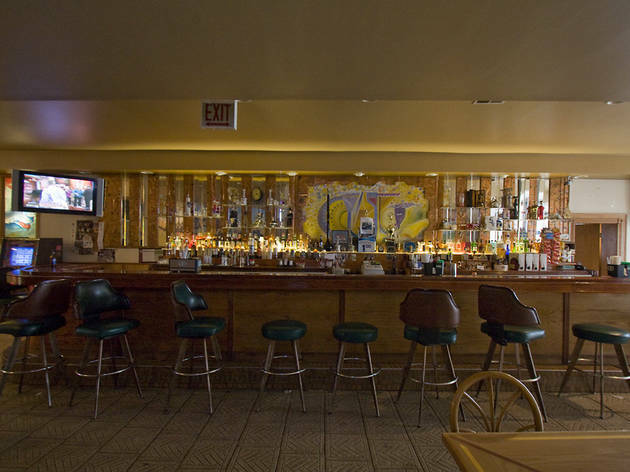 Our first stop, Jovial Club (9615 S Commercial Ave, 773-375-1203), scores immediate points for drivers: two ample parking lots. Inside, my first impression is of my grandpa’s basement. 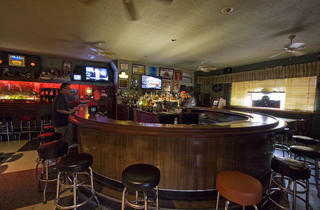 That is, if my grandpa’s basement had a large horseshoe bar with a few weary regulars sitting around it. But both boast black-and-white tiled floors, plenty of circa-1970s beer paraphernalia and a profound lack of natural light, in this case thanks to tightly drawn, dingy yellow blinds blocking the vibrant 2pm sunshine. This is a not a bad thing. It makes it seem natural, not guilt-inducing, to be indoors ordering booze in the middle of a beautiful day. Weekend evenings, servers push aside the expanse of tables and chairs to create a dance floor. “We have a DJ on Friday nights, girls. 9pm,” our bartender says cheerfully after we pay our tab ($8 for a strong vodka drink and a Miller Lite), slipping us a card. 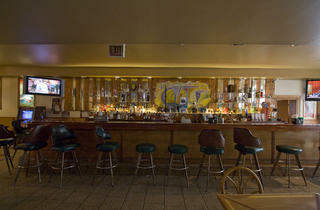 Next up: Roma’s Restaurant & Lounge (9247 S South Chicago Ave, 773-375-5700). We step directly into the “lounge” half, a long, narrow bar where mixed drinks come with the question, “Large or small?” Exotic liquor bottles (one shaped like an elephant; another, a caterpillar) line the shelves, but the crowd is a little more ragged than at Jovial, including a toothless old man who staggers from the pool table to the jukebox to blast—wait for it—Brandy & Monica’s “The Boy is Mine” at an obscene decibel. Followed by Toni Braxton’s “Unbreak my Heart.” I want to hear what’s next, but when the bartender hands us wooden tokens that say “good for one free drink” and points down the bar at a man with an eerie grin, we know it’s time to leave. 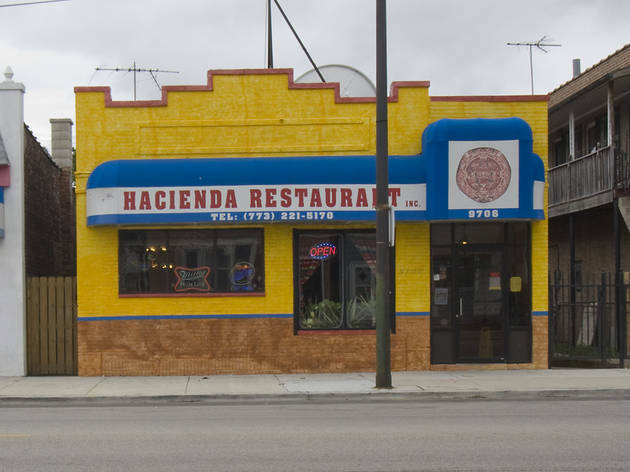 We end up at Taqueria Hacienda (9710 S Commercial Ave, 773-221-5743) in search of margaritas and a little liquor-sopping food. Here, shiny green tinsel hangs from the ceiling, pink faux flowers adorn tables, and chairs are hand-painted in every color of the rainbow. Equally vibrant margaritas come in lime or strawberry, with a similar prompt to Roma’s: “One shot or two?” Stress “on the rocks” to save yourself from the de facto frozen sugar bomb. The drink is still so candy tart you know you’re downing at least three shots of sweet and sour, but it hits the spot. So do chorizo tacos. Yet, the best bet is the nonalcoholic strawberry licuada, a thin milkshake topped with a hefty dose of cinnamon. 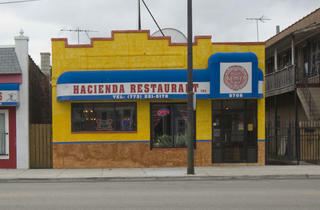 The taqueria has a full bar; ask for a splash of vodka in that milkshake to spice things up.